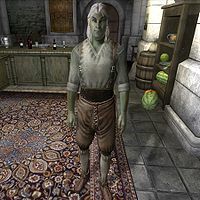 Nilphas Omellian, a Dunmer trader, is a merchant added by the Fighter's Stronghold official plug-in living at the Merchants Inn. He will provide you all the upgrades to restore Battlehorn Castle to its former glory. All day long he follows a simple and straight routine. He rises at 6am and his services will immediately be available to you. During the day he will simply wander around the ground floor of the inn until 8pm. At that time he will have dinner for two hours. After having satisfied his appetite, he returns to wandering around the inn, occasionally talking to one of the other merchants having dinner. At midnight he will stop his services, call it a day, and head back to his room. There he will sleep for six hours, resting from another day's work. Along with Rowley Eardwulf and Aurelinwae, Nilphas is one of the richest merchants in the game, with 2000 gold available for trading. This sum can be raised by investing in his store and raised even more once you are a master of Mercantile, at which point he will have a total of 3000 gold. His attire consists of a shirt with suspenders along with short britches and a pair of thick cowhide shoes. He also carries a small leveled amount of gold. He can use spells from all six schools of magic. Battlehorn Castle: Rescue Battlehorn Castle from marauders, and claim it as your own. His shirt with suspenders is one of only five in existence (or four without Shivering Isles installed). Since he is always essential, obtaining the item may prove next to impossible without the use of exploits. Any item that you sell to him will also appear in Velus Hosidius' barter inventory. Feeding on him as a vampire will cause him to stand at the top of the stairs for the remainder of his next business day, preventing him from receiving the trade option. This can be fixed by pushing him down the stairs, after which he will work regularly. ?